Irrigation supplies crops and other plants with necessary water and sometimes nutrients may be applied as well. In organic farming, conservation is important in irrigation practices, as is sustainability. While you certainly can irrigate organic crops similar to conventional ones, be sure to also focus on overall water usage and other factors, such as energy usage, as you design an irrigation system for your organic farm. 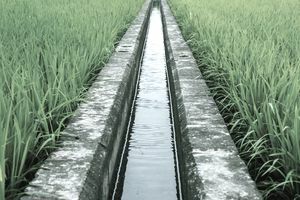 Although organic doesn't inherently mean environmentally friendly, growers should try their best to use an irrigation method that helps conserve water and energy. For example, a producer could use wastewater or a solar-powered irrigation system, which can save money, time and water. Organic farms tend to be smaller on average, and so their irrigation systems should match their scope. It's hard to beat the simplicity of manual irrigation for a tiny organic farm — you can add water when and where it's needed, and let the rain take care of the rest. But once your farm gets a bit bigger, you'll almost certainly need to consider alternatives to manual labor.